JJC CL-DF1 Dust-free Air Blower is applicable to removing dirt and dusts on camera lens, LCD and sensor, which is characterized in strong blowing and large volume of air output. The silicone air bag is soft, comfortable to your skin and for holding. The long blowing nozzle can clean dusts at deep parts, and the soft silicone nozzle cap can effectively avoid accidental surface scratching. Two single-way air valves are set at both air inlet and outlet to ensure the one way air flow and avoid the duty air flowing back, therefore guarantee only clean air blown out. Filter at air inlet is equipped with quality filtering cloth, which can filter dust particles with diameter over 21 μm. The filter also can be used as the base for vertical placing the blower, easy for keeping a using. This series product has three colors for your options. 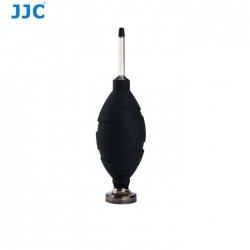 Additionally, the package includes three pieces of filter clothes and tool for installation, convenient for changing.